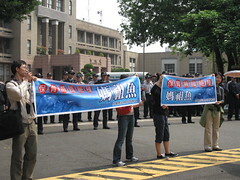 Yesterday morning, local conservation groups called upon the Executive Yuan to address the threat of certain types of fishing nets to Taiwan’s humpback dolphins (Sousa chinensis), responding to a petition by American conservation groups for the U.S. to ban imports of swordfish caught by Taiwanese gillnet and longline fisheries due to reportedly high levels of cetacean bycatch. The U.S.-based Centre for Biological Diversity and Turtle Island Restoration Network claim that much of the swordfish imported by the U.S. is sourced from countries that have failed to demonstrate that their fishing methods do not kill or otherwise harm cetaceans (whales, dolphins and porpoises) in numbers exceeding U.S. standards. The groups say that much of this fish is supplied by Taiwanese fisheries via intermediaries in Singapore, and that the information currently available on Taiwan indicates high levels of incidental catch (or “bycatch”) of cetaceans. The structure of gillnets make them particularly dangerous for cetaceans, which can become entangled in them and drown, while longlines can cause death by drowning, starvation, bleeding or infection when cetaceans become entangled in the lines or on the hooks attached to them, which can number into the thousands. 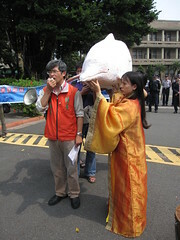 Yesterday morning, a procession of green groups arrived at their press conference at the gates of the Executive Yuan carrying a life-size model of a dolphin. Among them was Eagle Shih (施月英) of Changhua Coast Conservation Action dressed as Matsu, the Sea Goddess of the Matsu Religion after whom the humpback dolphin gets its local name “Matsu’s fish”. 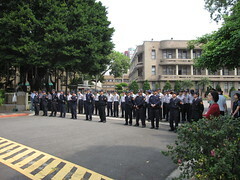 More than forty security guards blockaded the gate as the procession approached, as also happened in January last year when the groups first petitioned the Executive Yuan to take action to save the dolphins. Chin Ray (金磊) of the Hualien-based Kuroshio Ocean Education Foundation (黑潮海洋文教基金會) confirmed that considerable bycatch occurs on both the east and west coasts of Taiwan, often in drift gillnets. The groups said that despite their repeated calls for measures to prevent bycatch of critically endangered humpback dolphins in gillnet fisheries off the west coast, the government has done nothing and continues to drag its feet, allowing six-month delays between meetings and failing to officially designate the dolphins’ habitat. 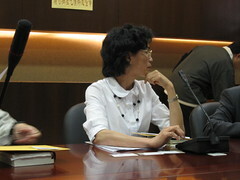 At a closed-door meeting which then took place inside the Executive Yuan, the groups spoke to Deputy Director Hsiao (蕭副組長) of the Fifth Division of the Executive Yuan and representatives from the Fisheries Agency and the Forestry Bureau. 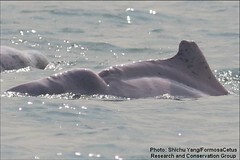 The groups first expressed disappointment at what they called the Executive Yuan’s ineffective treatment of the humpback dolphin issue last year and the fact that the government had restricted dialogue by only consulting a local cetacean researcher known to receive considerable funding from corporate and government industrial development bodies. They then made several requests, including that: the dolphins’ habitat be officially designated; funding be provided for international humpback dolphin experts to be invited to an “expert meeting” on the dolphins planned by the Environmental Protection Administration; information useful to the conservation of the dolphins be made readily available (such as that regarding numbers of gillnets and fish catch statistics for west coast waters, which the Fisheries Agency had so far failed to provide); and that future government meetings on the subject be made open to journalists and the general public. The previous two meetings, in August 2008 and February 2009, were by invitation-only, and the groups have said that on both occasions journalists and certain locally-based humpback dolphin researchers were excluded from the guest list. 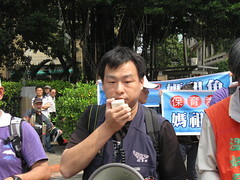 Hsiao asked the Forestry Bureau to find out which agencies could provide funding in order to bring international humpback dolphin experts to join the disussion, and indicated that such a budget should not be limited to one single expert meeting but should be allocated with continuing needs in mind. She also commented that under the Freedom of Information Act all information should be made available on request, even if it provided an opportunity for criticism of the government. On the matter of restricted access to humpback dolphin meetings she said that there was concern that journalists and the public may not fully understand the issue and may therefore "cause complications". The life-size humpback dolphin will make its next appearance tonight at the Chenlan Temple (鎮瀾宮) in Dachia (大甲), Taichung County, as members of humpback dolphin conservation groups join a traditional eight-day pilgrimage around nearby towns and villages in a bid to raise attention for the dolphins’ plight. Matsu's Fish Conservation Union Planning Office, Wild at Heart Legal Defense Assocation, Taiwan Academy of Ecology, Taiwan Sustainable Union, Green Party Taiwan, Changhua Environmental Protection Union, Changhua Coast Conservation Union, Kurishio Ocean Education Foundation, Taiwan Friends of the Global Greens and Mercy on the Earth.